What I love about this recipe is that, except for frying the salmon cakes, everything can be made ahead, and that takes the stress out of dinner parties. Just like perfect crab cakes that fall apart with the touch of a fork, these salmon cakes have no heavy binders and aren’t bogged down with fillers such as bread crumbs. The fresh taste of salmon, accented with ginger, onion, and herbs, makes these light, delectable, and crisp-edged when rolled in Japanese breadcrumbs. As a nice contrast and an addition to the plate, I’ve added a citrus-infused jicama slaw with lots of cilantro, red onion, and plump satsuma oranges. Make the salmon cakes: Preheat the oven to 250 degrees. Place the salmon in a shallow baking dish, rub all over with the olive oil, and season lightly with salt and pepper to taste. Bake the fish until the fat between the layers turns opaque, almost white, and the fish flakes slightly when pierced with a knife, 20 to 25 minutes. Alternatively, insert an instant-read thermometer into the thickest part of the salmon; when it registers 125 to 130 degrees, the fish is done. Set aside to cool. Meanwhile, in a nonstick skillet or sauté pan, melt the butter over medium heat and swirl to coat the pan. Add the ginger, onion, celery, and bell pepper. Sauté, stirring frequently, until the vegetables are soft but not brown, about 4 minutes. Add ½ teaspoon of salt and a few grinds of pepper. Set aside to cool. In a mixing bowl, combine the mayonnaise, lemon juice, cayenne pepper, thyme, chives, and parsley. Stir to blend. Remove the skin from the salmon and discard. Using a fork, flake the salmon into small pieces and add it to the mixing bowl. Add the vegetables. Using a rubber spatula, gently mix the ingredients, being careful not to mash the salmon. Form the mixture into 12 cakes about 1¾ inches in diameter and ½ inch thick. 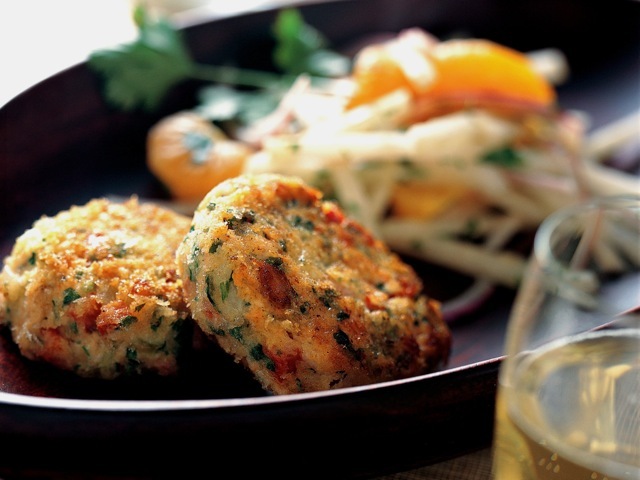 Place the salmon cakes on a rimmed baking sheet, cover, and refrigerate for at least 40 minutes or up to 8 hours. Make the jicama slaw: Combine the jicama, onion, satsumas, and cilantro in a large bowl. Toss to mix well. In a small bowl, combine the olive oil, lime juice, mustard, cumin, salt, sugar, and a few grinds of pepper to taste. Stir vigorously to blend. Taste and adjust the seasoning. Pour the dressing over all and toss to mix well. Taste and add more salt and pepper, if desired. Cover and refrigerate. (The jicama slaw can be made up to 1 day in advance.) Remove from the refrigerator 30 minutes before serving. Toss again just before serving. Finish and fry the salmon cakes: Spread the breadcrumbs on a dinner plate and roll the salmon cakes in the breadcrumbs, coating all sides well. Set aside. In a large sauté pan, preferably cast-iron, heat the remaining 2 tablespoons butter and the oil over medium-high heat. Swirl to coat the pan. Working in batches and without crowding the pan, brown the salmon cakes on one side, about 3 minutes, then flip them over and brown the other side, about 3 minutes longer. Serve immediately, accompanied with the jicama slaw. Serve these cakes with a Spanish albariño or Portuguese alvarinho.